Written on August 17, 2006, and categorized as Secret and Invisible. The ancient Egyptians believed that a person had to earn the right to enter the afterlife. Before an individual could pass into the next realm, nine great gods known collectively as the Ennead had to judge his worthiness. In Greek mythology, nine goddesses called the Muses were responsible for inspiring the art of musicians, artists, and writers. In Maya mythology, nine levels existed in the underworld. Metnal, the ninth level, was a place of eternal darkness, cold, and suffering. I lost nine minutes of recorded speech during the making of this podcast. Pod of Funk #9 seeks to alleviate your suffering with lashings of hot funk, some soothing beats, and a healthy dose of profanity. 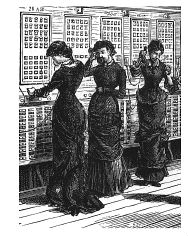 These women photographed earlier are playing the podcast directly into their bustles for a better bass response. As you can see they are quite excited by the combination of classic, rare and eclectic numbers which form the constituent parts of the podcast. 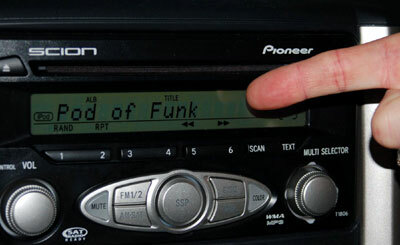 Thanks to Kate for this picture of Pod of Funk playing in her car stereo. I enjoy every one of these! Number nine was listened to on the Circular Quay to Manly Ferry yesterday. And you’re sooo right about Lily Allen.